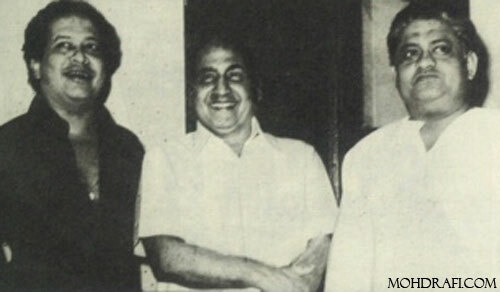 Mohammed Rafi Saab was very much at ease while singing any type of songs. He used to sing all types of songs effortlessly as usual maintaining the melody and his forte, throw of words. Whenever there are situations in our Films when the hero is betrayed by the Heroine, usually our Heroes sing songs wishing the heroine all the best and also narrate how they would sacrifice their love for the sake of her. But, as I recollect, there are two rare songs sung by Rafi Saab, where the hero expresses his hatred for his lady love for betraying him and the songs have hatred or Nafrat as the main theme. The first song which comes to mind is â€œGuzaren Hai Aaj Ishq Meâ€ from DIL DIYA DARD LIYA written by Shakeel Badayuni and music by Naushad picturised on the great Dilip Kumar. Betrayed by Waheeda Rehaman, DK sings the song and wishes that she also suffers the same fate what he has been subjected to. Guzare Hain Aaj Ishq Mein Hum Us Maqaam Se, Nafrat Si Ho Gayi Hai Mohabbat Ke Naam Se, the hero expresses his anguish and says that he has developed hatred for the word â€˜Mohabbatâ€™. In the second stanza, the hero becomes more vocal and wishes that her heart is also broken and she also veils and faces unhappiness. The third stanza further expresses the hatred of the hero when he clearly tells that he will not just weep and keep quiet, but would not even look at her and he also knows about different ways of taking revenge. The song is well written, set to good music, as usual sung meaningfully by Rafiji and superbly acted by DK, a treat to watch and listen to this song. Especially the stress on each and every word is to be observed. I am sure such a serious song also would have been recorded by Rafiji as usual with his typical smile on his face. The other song is â€œMere Dushman Tu Meriâ€ from AAYE DIN BAHARKE written by Ananda Bakshi and music by Lakshmikant Pyarelal picturised on Dharmendra. Fate intervenes and the lovers Dharmendra and Asha Parekh are separated. They meet accidentally in a Party and Dharmendra sees Asha with a child and suspects that his lady has betrayed him and hence, the song. He commences the song slowly telling the lady that she has played a joke on him by pretending like a friend but behaving like an enemy. Here also, the hero calls the lady his Dushman and says that let her also be deprived of friendship and happiness, who has given so much pain to him. The first stanza wishes that let her life be full of stones, not get any happiness, and suffer like he has been, why somebodyâ€™s love, even a smile should not be there in her life. The hero continues that her life should be full of loneliness, and in this life, she should not have, why her own, even unknown people. These two songs are unique in that Rafiji without losing the melody, expresses the hatred so beautifully. Of course, the MDs and the lyricists should be complimented for these two wonderful songs so also the Director and the Actors for the picturisation without which the song â€˜on screenâ€™ would not have been so effective. No wonder, the songs of fifties and sixties used to be so meaningful and the Lyricists had very important contribution in the making of a song. Some how, I always feel that with the dawn of seventies, the lyricists started losing their importance and the there were more prose than poetry in the songs, example being, â€œAchcha To Hum Chalte Hainâ€. Came eighties, even semblance of poetry in Hindi film songs was lost. Even prose was replaced with some sounds. Earlier the back-ground music in a song used to be really at the back-ground and the Singer was prominent, but later the Singer was hardly audible and the instruments became more louder. In fact, once Lataji sarcastically commented that earlier the Instruments used to give rest to Singers but now Singers are giving rest to Instruments. Perhaps, the latest craze A.R.Rehman is an exception and his songs give prominence to the Singers. I invite our other Rafi Fans to come out and share similar songs of hatred. This entry was posted on Sunday, August 31st, 2008 at 9:37 pm	and is filed under Audio Songs, Meri Awaaz Suno. You can follow any responses to this entry through the RSS 2.0 feed. You can leave a response, or trackback from your own site. Well, you still need a strong musical voice to express the hatred in poetry thru a mellifluous voice- this could only be done by Rafi Saheb. So convincing he carries the pain and anguish that for a change, the woman is made out a villian ! Rafi Saheb had the unique distinction of creating poetry out of poetry and created landmark in his renditions. We will never get one like him. “Agar Bewafa Tuzhko” is from “Raat Ke Andhere Me”. indeed an interesting article picked for rafians.just to share info , there are more hatred numbers particularly from MAA BIWI AUR BEHAN…..acha hi hua dil toot gaya ( beautifully rendered by saab ji ) ,shararat ……dil ne pyar kiya he ek bewafa se and in another film……agar bewafa tujhko pehechan jaate khuda ki kasam hum mohabbat na karte . “Koi Mujhse Poochhe Ke Tum Mere Kya Ho…” – this beautiful song has two sides in the same track! The first side praise his lover while the second side hate the same lover and so beautifully sung by Rafi Saheb from the film ‘Yeh Raasten Hai Pyar Ke’. A must for all Rafi Saheb fans. Definately amazing that he could sing these kinds of songs with so much “hate”, when in fact he was not experiencing these emotions in his personal life (I think). Anyone who has been cheated on, can feel the emotions getting stronger in these songs. Thanks so much for the article. I have already sent you the article about a week back. I am mailing it again. hi gurumurthy ji……… good article. keep it up. iam waiting for the promised article. ai dil hai mushkil jeena yahan , jara bach-ke, jara haske yeh hai bombay meri jaan – the song re-played in the background (full version) in the bollywood new movie “mumbai meri jaan” . lyrics by majrooh saaheb (birthday on oct.1) tuned by o.p.nayyar. there is no “nafrat” in the song – only a word of “caution” for the city of gold now called – mumbai – just for info for rafi saaheb lovers. its a wonderful feeling to see alot of people coming together and writing such beautiful write-ups on rafisaab.carry on the good work and keep rafisaab in ur hearts. In recent time apart of rehman i have hope on monty that he will definately bring some melodious music/tunes/prominence to singer. Saawariya’s music is live example. Bhagwan Ek Qasoor ki Itni Badi Saza from movie Gehra Daag. Tang AaChuke hein form movie Pyasa, it is a great song by Rafi Sb. Such type of songs are difficult to sing but Rafi Sb sung very beautifully and made these songs glorious part of music history. I always check my mail when i saw no mail about rafi sahib i feel so sad. Today when i open my mail i feel so happy to read all the above article. thanks for the corrections which are “very prompt” re : the song lyricist which is rajendra krishan indeed. a very rare jodi of rajendra krishan with l & p. a great one at that. this lyricist gave rafi saaheb the first great all india hit : suno suno ai duniya waalon, bapu ji ki amar kahani………….. tuneed by husanlal bhagatram brothers . yesterday, seen a movie called “mumbai meri jaan” and heard two songs in it by mohd rafi. first the haqueeqat one , Kar chale, few lines. and then the mohd rafi mumbaiya number at the climax : ai dil hai mushkil jeena yahan, jara bachke, jara hatke, yeh hai mumbai meri jaan…… yes the full song in pin drop silence – during the two minute silence observed to remember the train bomb victims on july 11` in mumbai – 2006.
its a good, well made movie and well appreciated. but the ticket rates in multiplex – es , of rs. 140 and above keep the masses away from such good movies. it will be regarded as a “flop” by the trade but money recovered by the producers through various channels including the distributors. my point is , i liked the movie and the mohd rafi songs in it. Great article! One point about Binu Nair’s comment: the song “Jo unki tamanna ho…’ (film Inteqaam) has been penned by Rajinder Kishen and not Anand Bakshi. Two other Rafi Saheb’s ‘nafrat’ gems are from Pyaasa (1957):’Yeh mahlon, yeh takhton…’ and ‘Yeh kooche yeh neelamghar dilkashi ke’, wrtitten powerfully by Sahir and set to brilliant music by S. D. Burman. Rafi Saheb’s vocal mastery just leaves the listeners spellbound! ref mail 1 ,the referred song is from `Inteqam` and the lyrics are by Rajinder Krishan ji. I fully agree with Shri. Ponnappaji. The way the word “Tarase” has been sung in the Rafi song and in the KK song, clearly brings out the superiority of the Rafi song and the capacity of Rafi Saab to feel the word and express the feelings. no words to say… only ears to listen …….and feelings….ofcourse! Kudos to Gurumurthyji for churning out theme after theme on different aspects of rafi sahab’s singing. what a novel idea to pick this theme and the two songs mentioned in the article, together with those contributed by binuji and s chandarji too rate very highly. another song that comes to mind instantly is from ‘aadmi’ – na aadmi ka koi bharosa na dosti ka koi thikana. here too in the second stanza of the song – one line says it all ” mere hi ghar ke charag ne khud jala diya mera aashiyana” conveying the hero’s hatred towards humanity which gave him all the pain in place of the love and affection that he himself had showered. these kind of songs are not tragic in nature but reflect simple contempt for the society which is cruel. great going gurumurthyji, what theme next?? Nice article, the song “Jaao Tum Bhi Jaao…” from the film “Dil Ka Raja” come to this catagory, the song nicely sung by Rafi Saheb and was picturised on late Raaj kumar. IT’S A NICE ARTICLE ! ( FILM : SHARARAT ; MUSIC BY GANESH ) . There are many other songs. I will leave it for others. jo unki tamanna ho, barbaad ho jaaye, to ai zindagi…….another l and p gem written by anand bakshi and lip synched by sanjay khan. truly, a great effort from mohd rafi. rafi lovers – pls do not miss listening this gem of a song.